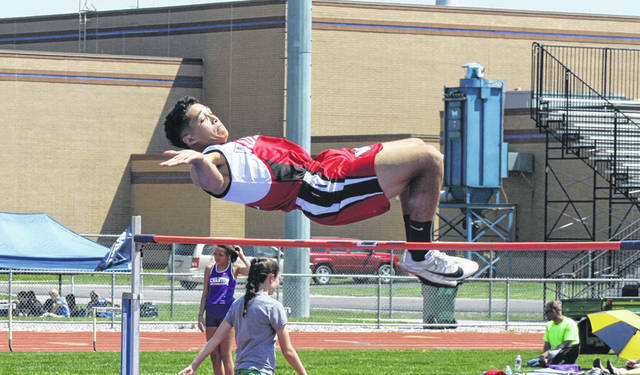 Wauseon’s Xavier Torres clears the bar in the high jump last season during the NWOAL Track and Field Championships. Torres won the title and was also league and a regional qualifier in the long jump for the Indians. J.T. 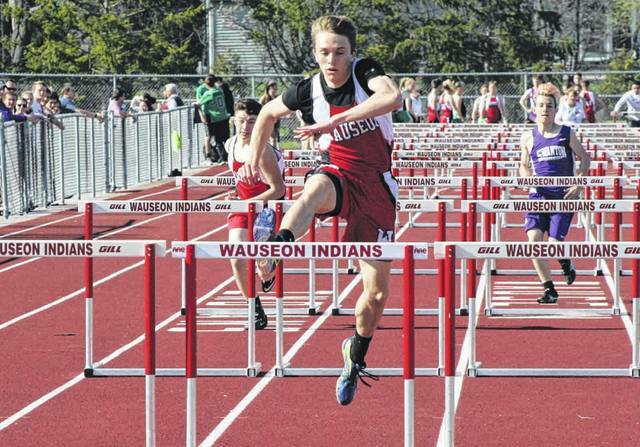 Hutchinson of Wauseon in the 110m hurdles during a home meet last season. He is back for the Indians this season. There are many unknowns for Wauseon boys track this season with a host of letter winners returning but few with postseason accolades. If their younger athletes can develop as the season progresses, it should make for a nice season. At the forefront for the Indians are their seniors. “I believe that our three returning senior letterwinners are going to have very good season,” stated Allen. “Xavier Torres is coming off a very successful wrestling season and was a regional qualifier for us in the long jump last season. I fully expect him to have a great senior season. Michael Cheezan is a two time state qualifier in the 4×800 relay and is very motivated to get back to state this year. Braden Hernandez is a very good sprinter. I believe he has a chance to get to the regional meet this year. Other returnees are J.T. Hutchinson (hurdles), Owen King (throws), Greg Moore (jumps), Andrew Pile (jumps), Sammy Sosa (throws), Noah Tester (sprints), Damian Veith (sprints), Andrew Higgins (hurdles), Benicio Vielma (hurdles), Noah Sauber (sprints), Braden Vernot (distance) and Layton Willson (distance). They are also adding newcomers Samuel Blanco, Anthony Cheezan, Braxton Goings, Carter Hite, Dylan Michael, Carter Nofziger, Zach Pfund, Davon Ramos, Jonas Tester, Luke Tester, Hunter Wasnich, Isaac Wilson and Jaytin Windisch. But, the Indians will have to replace multiple-time state qualifier, Kyle Vernot. Last year as a senior, Vernot placed fifth at state in the 1600 meter run. Also gone is Josh Lowry, who placed seventh in the state in the 3200 meter run last season. Both Lowry and Vernot qualified as part of the 4×800 meter relay team that finished ninth at state. Others who graduated were Lukas Dominique, Junior Martinez, Brandon Moore, Owen Newlove, Cam Sauber and Kyle Zirkle. Allen implies that it could be an uphill battle for his boys to capture a Northwest Ohio Athletic League title this season. The Indians won the league in 2018 and were also co-district champions at the Division II Defiance District.